This year for Christmas, no gløgg nor æbleskiver, I wanted to try “pebernødder” (lit. 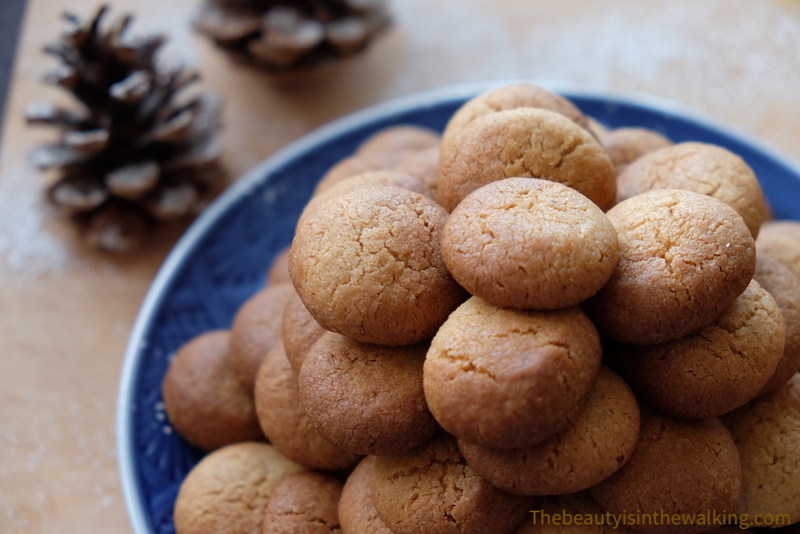 “pepper nuts”), incredibly flavourful and crispy Danish Christmas cookies. Since November, we have seen them being sold in small bags in every bakery and supermarket in Copenhagen. And two days before Christmas, I have finally found enough time to bake two nice batches. Pebernødder are one of the oldest Christmas cookies in Denmark; they first appeared in the 1400s. At that time, they did not necessarily contain pepper, which was an expensive product but were just spiced enough to have a strong flavour. What’s interesting is that when talking about “pebernødder” in Danish, it means little money but the opposite “en pebret pris” (lit. “a peppery price”, the equivalent to “a steep price”) means something is very expensive, because pepper was very expensive in the Middle Ages and was almost worth its weight in gold. If we make “peberkager” (pepper cookies) all year long, we generally only make pebernødder around Christmas. We can also find them in several countries around Denmark, and especially in Germany, where they’re named “Pfeffernüssen”, a land that strongly influenced the Danish culture. The name of the pebernødder originates from the fact they were compared to nuts for their colour and size, but also because they were then baked without any sort of yeast, right after the end of the bread-baking in large baking ovens, which made them extremely hard – like nuts. Well, enough explanations, here is the recipe. In a big bowl, stir the butter and the sugar well together. Mix together the spices, baking soda, baking powder and flour, and add to the above preparation. Mix well. Take a big piece of dough and roll it into a 1.5 cm (0.6 inch) diameter sausage. Cut it in 1 cm (0.40 inch) long pieces. Put them in line on the buttered and floured baking sheet (or covered with baking paper). You can also roll the small pieces into balls and slightly squeeze them when putting them on the baking tray, to give them the traditional round shape, as I did. Repeat the operation with the rest of the dough. Bake at 190°C (374°F) for 10 min until the cookies are light brown and slightly risen. Let them to cool, before storing in a tin box. This is a new one for me to try Veron. Merci beaucoup! Have a wonderful Christmas you two. I’ve been thinking of our Christmas two years ago and your log And the difference your net Christmas will be! We miss you both. I’m sure you’ll like them. Hope you had a wonderful Christmas and I thought of our Aussie Christmas two years ago. That was such a wonderful time with you!